Anyone who has uploaded an ebook to Amazon’s KDP program (in Microsoft Word .doc format) knows what I am talking about. 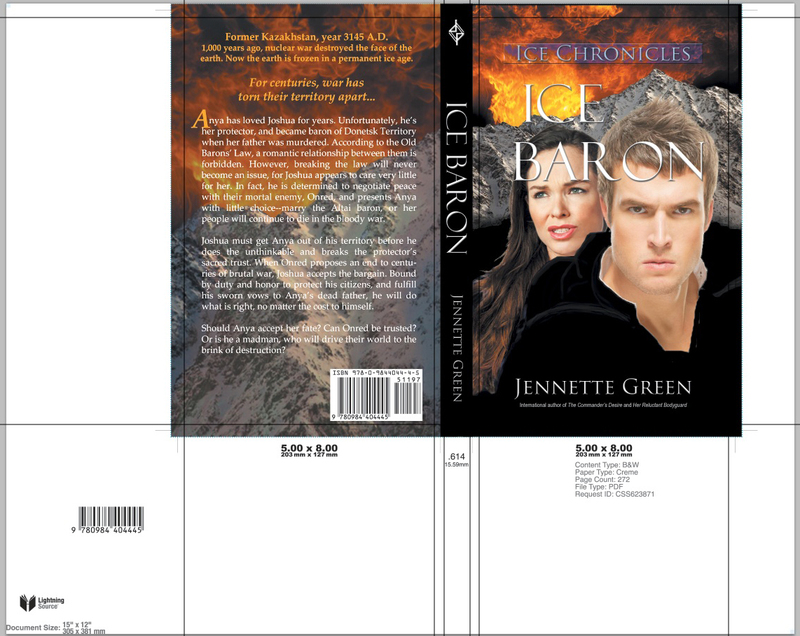 Indents are added to every single paragraph in the entire book! If you are a perfectionist, like myself, formatting a book for Kindle can sometimes be a frustrating experience. Never fear, however, for this article will explain how self publishers can easily learn how to format a book for Kindle, and make it look nice, too. Now, if you’re self publishing a fiction novel, that little nuisance may not bother you. Most paragraphs in your book will be indented, anyway. Perhaps you’d rather your copyright page not have indented paragraphs, but that is a small enough matter to ignore. However, if you’re self publishing ebooks with flush left paragraphs (or flush left chapter headings, etc. 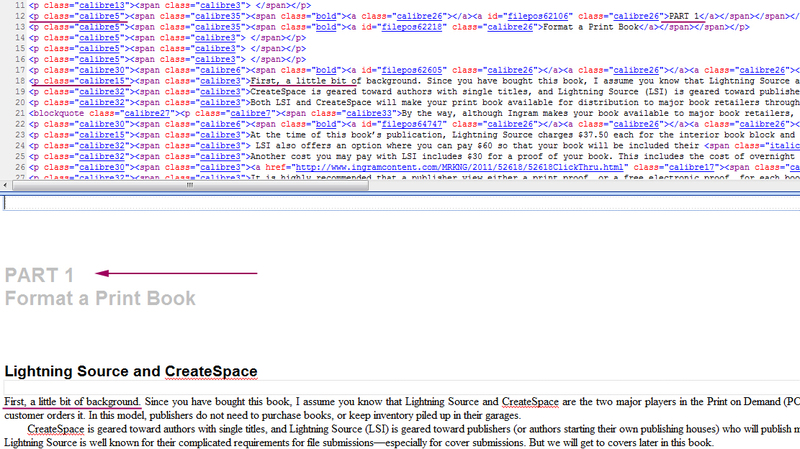 ), the indents that Kindle adds can make your ebook(s) look unprofessional. 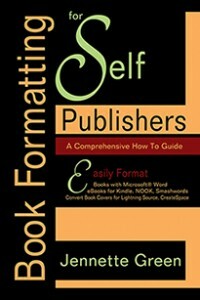 I recently published Book Formatting for Self-Publishers, A Comprehensive How-To Guide on Kindle, and became aware of just how ugly all of those automatic indents could look. I had spent quite a bit of time formatting the book to look exactly as I’d like it to in my Word .doc, and was not happy that Kindle reformatted my file. Originally, chapter headings were flush left, the first paragraph of each section was flush left, “tips” and “notes” were formatted into block paragraphs, and so on. 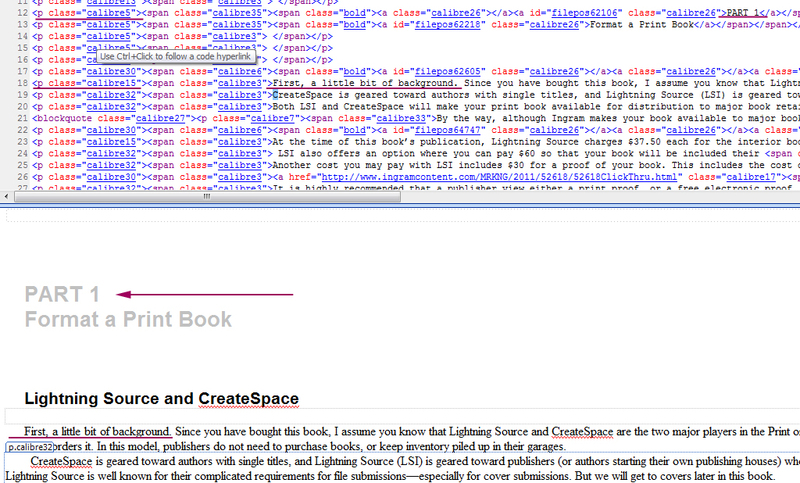 When I uploaded the book to Kindle, all of my careful book formatting disappeared! Chapter headings were indented about a quarter inch. All paragraphs were indented. My “tips” and “notes” block paragraphs were indented on the first line–it looked terrible. What to do? To make a long story short, I discovered that although the KDP platform does automatically add indents to Microsoft Word .docs (the file recommended for upload by KDP), it does not add indents to uploaded .ePub files. 5) Using Windows Explorer, convert the ePUB file to a zip file. (Change the file extension from .epub to .zip) **If you’re not sure how to do this, see the end of this article for instructions. 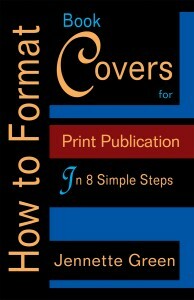 7) For tips on adjusting the cover image, please see the previous post, Downsampled Images in eBooks for PubIt! 8 ) ***Make adjustments to the CSS file (the rest of this post will show you how). 9) Make a new, empty zip file. Copy the mimetype file from the EPUBFolder first, and paste it into your new zip file. Then copy all of the remaining files from your EPUBFolder (except the mimetype file) and paste them into your new zip. Change the .zip extension to .epub. Those may seem like a lot of steps, but each of them is exceptionally easy to do. For the remainder of this post, I will explain how to change the CSS in your .ePub file to eliminate the indented paragraphs in your Kindle file. While this may sound complicated, it is not. The best was to make these changes is to use an html editor, such as Microsoft Expression Web, Adobe Dreamweaver, or another html editor. It is also possible to use Notepad, although it may be more difficult to use Notepad, as you will only see the code, and not the end result in WYSIWYG format. One free html editor available online is KompoZer. Although I have never used it (and therefore cannot officially recommend it), it is recommended by a site that also provides information on editing .ePub files. See this article to learn more about it. Now we’ll get down to the nitty gritty. You will notice that code has been underlined in the top portion of the image. 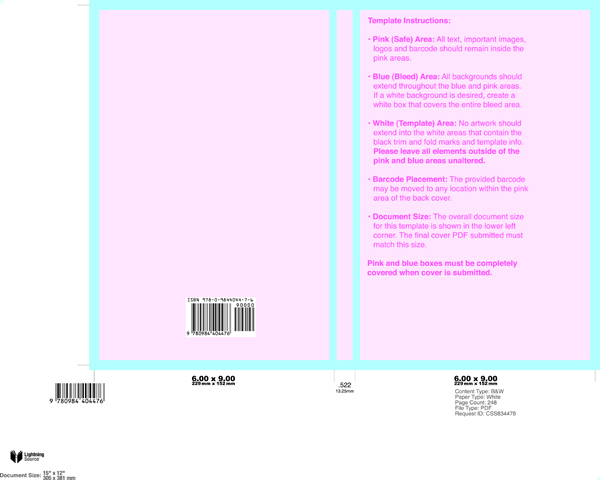 The CSS style code p class=”calibre5″ affects “PART,” which is also underlined. 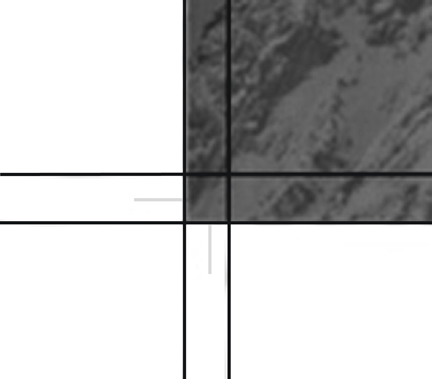 The ereader WYSIWYG format is below, and an arrow points to “PART.” You can see that it is indented. Similarly, p class=”calibre15″ modifies “First, a little bit of background.” And so on. 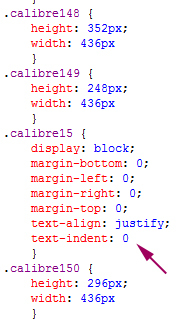 The CSS code calibre15, calibre5, and several others need to be modified in order to eliminate the different indents. 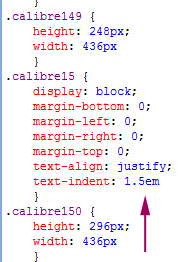 We will work with calibre15, but the same steps can be applied to all other CSS codes that need to be fixed. The arrow is pointing to text-indent: 1.5em. In order to delete the indents, change this code to read text-indent: 0 as shown in the following image. Save the CSS file. After all of the CSS is modified, and the stylesheet.css file has been saved, the results are much better. You’ll probably want to go through all of the pages in your document, just to make sure the indents look correct on each page. The one page where you might run into a problem is the Table of Contents page, particularly if it is specially formatted by Microsoft Word’s automatic ToC generator. It may have fancy indents that you would like to keep, and yet they may be formatted with the same CSS code (such as calibre15) that we just modified to delete the indent! What to do in this situation? Simple enough. Make a whole new CSS style for each indent in your ToC. For example, copy the entire calibre15 code, paste it in the stylesheet.css file after calibre15, and rename it calibre1555, for example. 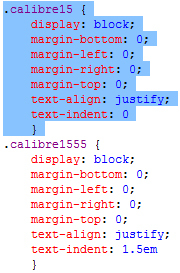 Change the calibre1555 text-indent to 1.5em, or whatever you’d like. Save the CSS file. Go to your dummy_split page for your ToC. Find all calibre15, and replace it with calibre1555. See if the indent is to your liking. If not, change it again. Next, go on to Step Nine, listed above, to finish putting together your .ePub file for upload to the Kindle KDP Platform. 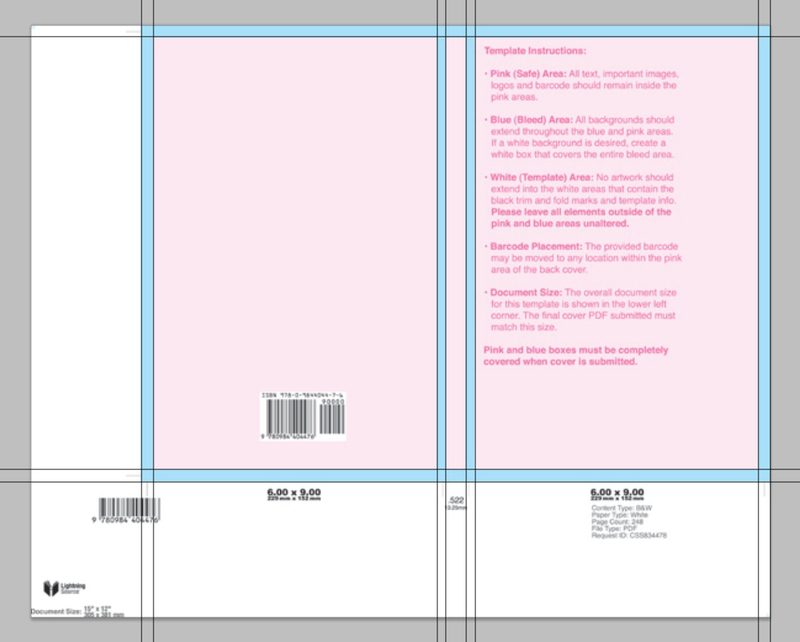 I hope this post on how to self publish a book on Kindle has been helpful–it certainly is long! If you have any questions, please leave a comment, and I’ll clarify anything that needs it. Now all file extensions should be visible and editable, via the “Rename” file feature.